We are both grateful and excited that, in less than a year since our international launch, Oveit has managed to reach Top 10 in Capterra’s Top 20 Most User-Friendly Event Management Software infographic. “The rankings are determined by an algorithm that awards points for usability, customer service and reviews” , said Rachel Wille, Senior Product Research Analyst at Capterra. When developing the software we always had our users in mind so this recognition confirms that we are on the right path. Our app helps you sell tickets (and create separate ticketing for you attendees), create registration forms and personalize registration e-mails. You receive payments instantly by connecting your payment processor account and, furthermore, Oveit helps you issue invoices automatically after payments are processed. It has a been a short yet awesome ride for us till now. Our focus is to always keep improving and innovate within this dynamic and challenging industry. Oveit is making surpassing progress in event tech. We made it our mission to deliver increasingly user friendly Event Management tools while offering the latest technology such as RFID and NFC wearables. 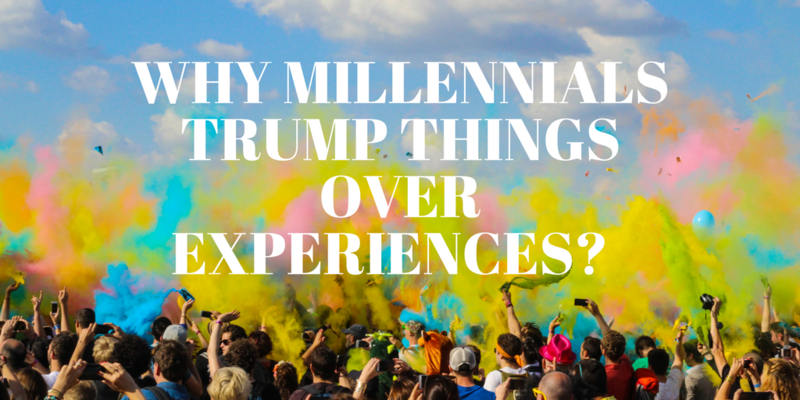 Millennials value experiences over things. Each step of millennials’ life is getting upgraded to an ubiquitous experience. Either if it is about dinning, traveling or the way they are shopping, the overall experience is becoming more and more important in order to create a sense of identity in their life. Harris group found that millennials believe that living a meaningful and happy life isn’t about possessions and rather about creating memories through experiences. Their spending on live experiences and events relative to total U.S. consumer spending increased 70 percent comparing to the previous generation. The concept of meaningful life, started markedly with the need of millennials to become more conscious regarding their emotional wellbeing and health. The need of experiences rather than things can be associated to a higher level of awareness brought by both self and social responsibility. Awareness of both positive and negative factors influencing our life is possible through the power of media, that grew exponentially in the past years. Most of the millennials are well informed with strong beliefs and eager to support different causes. Only 1 percent of Millennials say they are influenced in any way by advertising (Elite Day). Millennials don’t trust what the brand has to say about itself. They need to believe in it in order to adopt it, and the best way of doing this is through memorable experiences. These experiences will allow them to identify themselves and their values with the brand’s. The experience offered by an event is unique because it gives not one but 3 stages: the anticipation, the event itself and the memories after. “Not only does that final stage last forever, but you can also share it”(Jack Huang, Bloomberg). Millennials expect their whole life to be an experience full of excitement. An experience that can generate a familiar bouquet of beliefs that matches their core values. Consequently most of millennials are anxious about challenges that not only correspond to their values but as well will help promote their personal identity through social media. The use of brands has an important role in creating a higher impact and credibility for their social media content. Millennials are more prone to adopt and become loyal to a brand with whom they shared a memorable experience. Succeeding in doing this will end up being beneficial for both parties. The brand will win new adopters and the adopters will start to develop a shared identity with the brand’s core values. This may be considered the key milestone in the process of acquiring new adopters and especially millennials. Comparing Millennials with the Boomers Generation, their spending on experiences grew with 12% and they are considered “digital natives” with 43.5 percent of them who say they use social media to spread the word about products or services. Brands or organisations that create experiences for their audience need to truly “get” Millennials in order to engage with them appropriately and create an opportunity to differentiate themselves in the marketplace and forge long-term relationship with their customers. What does it mean to truly “get” Millennials? Being true and following your mission at all times. Having the vision to aspire high and always greed of offering your consumer the best quality, price and services. And nevertheless immerse your consumers in memorable experiences because today experiences are like a merry-go-round – you can never get off. You have crafted a plan for the perfect event. A well-known influencer/artist is the keynote speaker/leading star, you have a long long list of sponsors, great venue, excellent catering and a perfect weather forecast (ok, this in fact is a myth, but you get the picture). So, as a friend of mine likes to say, you are “jacked up and good to go”. But the work is only half done (to say the least) and here are a few things that can go terribly wrong of surprisingly well (luckily today’s event management tools can help you). Tickets. Maybe you have the perfect marketing plan and everyone hears about your event but, if your attendees need to go the extra mile to buy them, then you have a problem. If you use social media for marketing make sure that the ticket is only a few clicks away from your fb/twitter/instagram account (better said a few screen touches away). Every extra step that the customer has to take to buy your ticket decreases the chances that he will actually finish the process. Here’s a hint: use a software that allows you to sell tickets on your personal site/blog. One of the most annoying things in the world is waiting in the line with a paid ticket in your phone (3 years ago i would’ve said pocket). Today you can use a simple application (downloaded on your personal phone) to check-in your guests and have real time access to relevant data about who arrived when. Don’t disrespect your customers by making them wait while you verify printed check-lists. Help attendees do more with just one ticket. For example,at a concert, the VIP tickets can include a free t-shirt, a backstage pass and 2 bottles of water, all in the same QR code. The same e-ticket (stored on your client’s phone) will be used at the front gate, at the bar, at the souvenir shop and at backstage entrance. Embrace technology, offer a memorable experience to your clients and the word will spread like wildfire.